One of the things I like least about my way of working is knowing exactly what I want to do, but not having enough fabric to do it. Perversely this is also one of the things I like best - being forced to find creative solutions, work my way around a problem. This week there has been a lot of that. With the benefit of hindsight I could have done with one extra fabric/shirt in the mix for this quilt. Several of my choices were fat quarters (like the map fabric) or scraps left over from other things (like the brown plaid shirt) and life would be easy now if there was more of them. For instance, I thought I would like circle blocks if the circles were slightly larger, but there was no way that was going to be an option. Then I thought about returning to the idea of quarter circles - you will see what I've done in the photo below. I didn't need new fabric for these, as I just chopped up the circles I already had and then added an extra round or two. I still need to work out what goes around them, but I have been saving a couple of biggish pieces so hopefully that will not pose too many problems. Practicalities are also driving the string blocks now, so I am making more of the smaller ones -piecing scraps together where I have to. This scraping a finish when you half think you can't make it gets quite exciting! I like the addition of circular elements since there are circle motifs in the "gear" fabric. Also like the arcs as opposed to just circles. The colors in this one remind me of chocolate mint cookies. Changing to quarter circles works really well. Good luck stretching your fabric and/or finding others that coordinate with your palette! So far so good! Love the thought processes too! Too bad I don't live closer, I would let you go through my shirt stash. I bet I have some greens, teals and browns that would work! I like the larger patches of the green showing. I like what you have done. Great process post - keep going!!!!! I love the movement created by the string blocks. I have to agree with "One of the things I like least about my way of working is knowing exactly what I want to do, but not having enough fabric to do it. Perversely this is also one of the things I like best - being forced to find creative solutions, work my way around a problem." 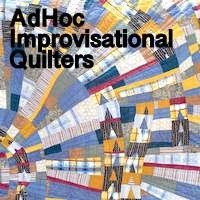 I think that is one of the reasons I love so many vintage quilts - creative solutions. It's all in your perspective, right. So....it's exciting!